So we are going to take “all necessary measures” to protect the civilians of Libya, are we? Pity we didn’t think of that 42 years ago. Or 41 years ago. Or… well, you know the rest. And let’s not be fooled by what the UN resolution really means. Yet again, it’s going to be regime-change. And just as in Iraq – to use one of Tom Friedman’s only memorable phrases of the time – when the latest dictator goes, who knows what kind of bats will come flying out of the box? And after Tunisia, after Egypt, it’s got to be Libya, hasn’t it? The Arabs of North Africa are demanding freedom, democracy, liberation from oppression. Yes, that’s what they have in common. But what these nations also have in common is that it was us, the West, that nurtured their dictatorships decade after decade after decade. The French cuddled up to Ben Ali, the Americans stroked Mubarak, while the Italians groomed Gaddafi until our own glorious leader went to resurrect him from the political dead. Could this be, I wonder, why we have not heard from Lord Blair of Isfahan recently? Surely he should be up there, clapping his hands with glee at another humanitarian intervention. Perhaps he is just resting between parts. Or maybe, like the dragons in Spenser’s Faerie Queen, he is quietly vomiting forth Catholic tracts with all the enthusiasm of a Gaddafi in full flow. So let’s twitch the curtain just a bit and look at the darkness behind it. Yes, Gaddafi is completely bonkers, flaky, a crackpot on the level of Ahmadinejad of Iran and Lieberman of Israel – who once, by the way, drivelled on about how Mubarak could “go to hell” yet quaked with fear when Mubarak was indeed hurtled in that direction. And there is a racist element in all this. The Middle East seems to produce these ravers – as opposed to Europe, which in the past 100 years has only produced Berlusconi, Mussolini, Stalin and the little chap who used to be a corporal in the 16th List Bavarian reserve infantry, but who went really crackers when he got elected in 1933 – but now we are cleaning up the Middle East again and can forget our own colonial past in this sandpit. And why not, when Gaddafi tells the people of Benghazi that “we will come, ‘zenga, zenga’ (alley by alley), house by house, room by room.” Surely this is a humanitarian intervention that really, really, really is a good idea. After all, there will be no “boots on the ground”. Of course, if this revolution was being violently suppressed in, say, Mauritania, I don’t think we would be demanding no-fly zones. Nor in Ivory Coast, come to think of it. Nor anywhere else in Africa that didn’t have oil, gas or mineral deposits or wasn’t of importance in our protection of Israel, the latter being the real reason we care so much about Egypt. So here are a few things that could go wrong, a sidelong glance at those bats still nestling in the glistening, dank interior of their box. Suppose Gaddafi clings on in Tripoli and the British and French and Americans shoot down all his aircraft, blow up all his airfields, assault his armour and missile batteries and he simply doesn’t fade away. I noticed on Thursday how, just before the UN vote, the Pentagon started briefing journalists on the dangers of the whole affair; that it could take “days” just to set up a no-fly zone. Then there is the trickery and knavery of Gaddafi himself. We saw it yesterday when his Foreign Minister announced a ceasefire and an end to “military operations” knowing full well, of course, that a Nato force committed to regime-change would not accept it, thus allowing Gaddafi to present himself as a peace-loving Arab leader who is the victim of Western aggression: Omar Mukhtar Lives Again. And what if we are simply not in time, if Gaddafi’s tanks keep on rolling? Do we then send in our mercenaries to help the “rebels”. Do we set up temporary shop in Benghazi, with advisers and NGOs and the usual diplomatic flummery? Note how, at this most critical moment, we are no longer talking about the tribes of Libya, those hardy warrior people whom we invoked with such enthusiasm a couple of weeks ago. We talk now about the need to protect “the Libyan people”, no longer registering the Senoussi, the most powerful group of tribal families in Benghazi, whose men have been doing much of the fighting. King Idris, overthrown by Gaddafi in 1969, was a Senoussi. The red, black and green “rebel” flag – the old flag of pre-revolutionary Libya – is in fact the Idris flag, a Senoussi flag. Now let’s suppose they get to Tripoli (the point of the whole exercise, is it not? ), are they going to be welcomed there? Yes, there were protests in the capital. But many of those brave demonstrators themselves originally came from Benghazi. 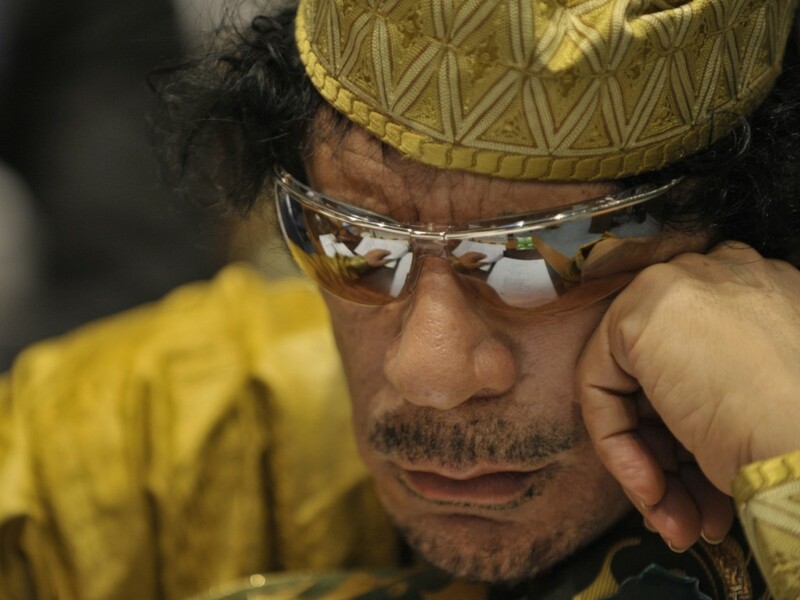 What will Gaddafi’s supporters do? “Melt away”? Suddenly find that they hated Gaddafi after all and join the revolution? Or continue the civil war? And what if the “rebels” enter Tripoli and decide Gaddafi and his crazed son Saif al-Islam should meet their just rewards, along with their henchmen? Are we going to close our eyes to revenge killings, public hangings, the kind of treatment Gaddafi’s criminals have meted out for many a long year? I wonder. Libya is not Egypt. Again, Gaddafi is a fruitcake and, given his weird performance with his Green Book on the balcony of his bombed-out house, he probably does occasionally chew carpets as well. I know the old arguments, of course. However bad our behaviour in the past, what should we do now? It’s a bit late to be asking that. We loved Gaddafi when he took over in 1969 and then, after he showed he was a chicken-head, we hated him and then we loved him again – I am referring to Lord Blair’s laying on of hands – and now we hate him again. Didn’t Arafat have a back-to-front but similar track record for the Israelis and Americans? First he was a super-terrorist longing to destroy Israel, then he was a super-statesman shaking hands with Yitzhak Rabin, then he became a super-terrorist again when he realised he’d been tricked over the future of “Palestine”. One thing we can do is spot the future Gaddafis and Saddams whom we are breeding right now, the future crackpot, torture-chamber sadists who are cultivating their young bats with our economic help. In Uzbekistan, for example. And in Turkmenistan. And in Tajikistan and Chechenya and other “stans”. But no. These are men we have to deal with, men who will sell us oil, buy our arms and keep Muslim “terrorists” at bay. It is all wearingly familiar. And now we are back at it again, banging our desks in spiritual unity. We don’t have many options, do we, unless we want to see another Srebrenica? But hold on. Didn’t that happen long after we had imposed our “no-fly” zone over Bosnia?